Why is drowning prevention important? There were 49 drowning deaths to children 0-18 years old during the ten-year period of 2005-2014. This made drowning the 2nd leading cause of injury-related mortality among children under 18 years of age over that time period, behind only deaths among automobile occupants (54), and ahead of suicides (45), suffocations (mostly (34 deaths) among infants), homicides (29), and pedestrian (27) and motorcycle/moped crashes (14). 21 of these deaths were in the ocean/saltwater, 15 in a swimming pool, 7 in bathtubs, 2 in rivers/streams, and 4 unknown or other water environment. Q: How can I lower my risk of drowning? Q: What other things can I do to help keep myself and my family safe? Q: Where can I find information about which beaches are safe? A: The Hawaii Beach Safety website gives Hawaii beach users timely and accurate information for choosing a beach destination appropriate to their ocean skill level. Use this site in conjunction with consultation with the lifeguard on duty to make an aware and informed decision before entering the water. Q: Which beaches have lifeguards? A: The Hawaii Beach Safety website provides detailed information about lifeguarded beaches on each island, including a map of beach locations. Q: What’s the “Best” personal flotation device (PFD)? A: In terms of risk of drowning, the best Personal Flotation Device (PFD) is the one that matches your needs!! Some of the choices are a better for certain situations than others, and therefore the choices are explained in the “Think Safe” PFD pamphlet that is sold with every US Coast Guard approved PFD. By reading the pamphlet, you can understand how to safely have fun on the water. Myth: Swimming lessons prevent drowning. Myth: Active-drowning persons show signs of distress by calling out for help. Truth: People who are actively drowning are unable to speak. Speaking is a function secondary to breathing. If someone cannot breathe, they cannot speak. Active drowning persons will alternately sink below and then rise above the water’s surface. While they are above the surface, they will exhale and inhale before they sink again. There is not enough time to cry out. Myth: Active-drowning persons show signs of distress by waving their arms for help. Truth: Someone in the active-drowning stage often presses down on the surface and tries to use it as leverage to get their mouth out to breathe. Onlookers might see arm movements that appear to be flapping the water not waving in the air. The updated 2008-2012 Summary on Drowning (PDF 19 KB) for more detail. 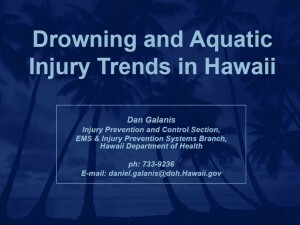 An overview of ocean incidents in Hawaii, presentation by Dan Galanis. Please contact epidemiologist dan.galanis@doh.hawaii.gov for more information. 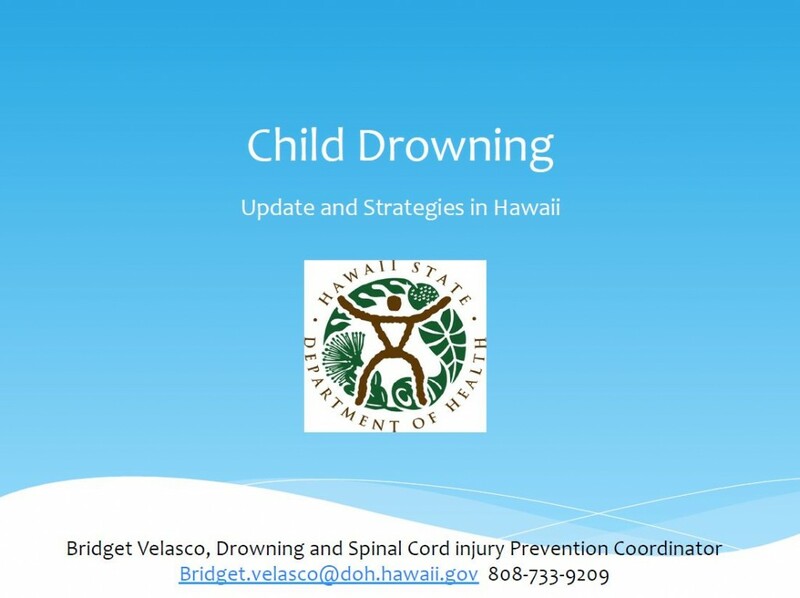 An overview of child drowning in Hawaii, presentation by Bridget Velasco. Please contact drowning prevention coordinator bridget.velasco@doh.hawaii.gov for more information. One of the recommendations was the establishment of a statewide task force to work with the issue of drowning and water related injuries. The Drowning and Aquatic Injury Prevention Advisory Committee was formed in Fall 2015. The Advisory Committee is comprised of representatives from roughly one dozen agencies (see list below) that have influence over the prevention of drowning in Hawaii. The Advisory Committee’s mission is to reduce the incidence of drowning and water related spinal cord injuries in Hawaii through networking, education, advocacy and resource development. The Advisory Committee, in conjunction with the Task Force, will establish, implement, evaluate and disseminate best practices for drowning and spinal cord injury prevention in the state of Hawaii. 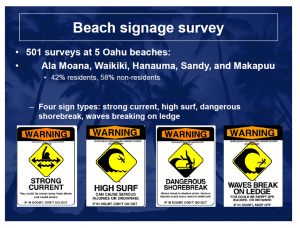 In 2009, the Injury Prevention and Control Section (IPCS) surveyed over 500 beach goers on O‘ahu, both residents and visitors, to assess the impact of four types of beach warning signs: strong current, high surf, dangerous shore break, and waves breaking on ledge. Results showed that about half of those surveyed saw the signs, and among those, 66% thought the signs would influence their behavior. Swim lessons are an important part of beach and pool safety. Many organizations in Hawaii provide swim lessons. Here is a list of some Swimming Resources by County. The Hawaii Beach Safety website gives Hawaii beach users timely and accurate information for choosing a beach destination appropriate to their ocean skill level. Use this site to help you make an aware and informed decision based on the latest information. When you get to the beach, be sure to check with the lifeguards for problems and hazards that may affect your safety. The CSN is providing this special resource of information on water safety. 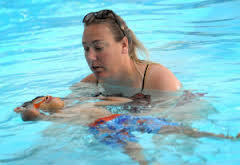 This resource contains information about water safety laws; prevention strategies and programs; evaluations of the effectiveness of lifeguards and swimming lessons to support safe swimming practices; policies and campaigns to encourage water safety; and safety barrier restrictions and other safety guidelines. Educate the public on the importance of constant supervision of children in and around water. U.S. Consumer Product Safety Commission (CPSC) created Pool Safely: Simple Steps Save Lives, a national public education campaign to reduce childhood drowning, non-fatal sub­mersions and entrapments in public swimming pools and spas. The campaign carries out the requirements of the Virginia Graeme Baker Pool & Spa Safety Act (P&SS Act), federal legislation mandating new requirements for public pools and spas, including a public informa­tion campaign. Pool safely is designed to raise public awareness, promote industry compliance and improve safety at pools and spas. Whether it’s an uneven lake bottom or drop-off, rip current or unexpected hazardous weather, swimmers in natural water settings need to be aware of the dangers and take special precautions to stay safe. Scroll to mid-page. Learning to swim is the best defense against drowning. The United States Lifesaving Association created 10 tips to prevent drowning. The United States Lifesaving Association created Spinal Injury Avoidance Tips. U.S. Consumer Product Safety Commission (CPSC): How to plan for the unexpected? The information below can help parents and caregivers provide young children with the protection they deserve. This U.S. Consumer Product Safety Commission (CPSC) handbook offers guidelines for pool barriers that can help prevent most submersion incidents involving young children. The CPSC standards are not mandatory requirements. Therefore, the Commission does not endorse these guidelines as the sole method to minimize pool drowning of young children. This U.S. Consumer Product Safety Commission (CPSC) booklet offers guidelines for pool barriers that can help prevent most submersion incidents involving young children. This handbook is designed for use by owners, purchasers, and builders of residential pools, spas, and hot tubs. The U.S. Coast Guard’s Boating Safety Division created a database guide, supplied by the states and collectively updated during 2007. U.S. Coast Guard Auxiliary boating courses provide instruction to boaters at all levels, from the fundamental to the advanced. Classes are taught by experienced and knowledgeable instructors committed to the highest standards of the U.S. Coast Guard. 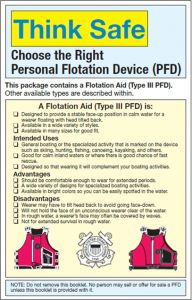 The Coast Guard is working with the PFD community to revise the classification and labeling of PFDs. When completed, this information will be updated and hopefully be somewhat easier to understand. Meanwhile, spending a few minutes to understand the many options available to find a PFD that you’re willing to wear could mean the difference between life and death for you or a loved one.